Moored at the marina, the 24.64m-long Sanlorenzo SL78 made her Southeast Asia premiere at this year’s Singapore Yacht Show. The entry-level motoryacht is the next generation of the Italian builder’s fibreglass planning range, reaching 30 knots with her twin 1,622HP diesels. And thanks to revolutionary stabilisers, she’s well-balanced while moving and resting too. 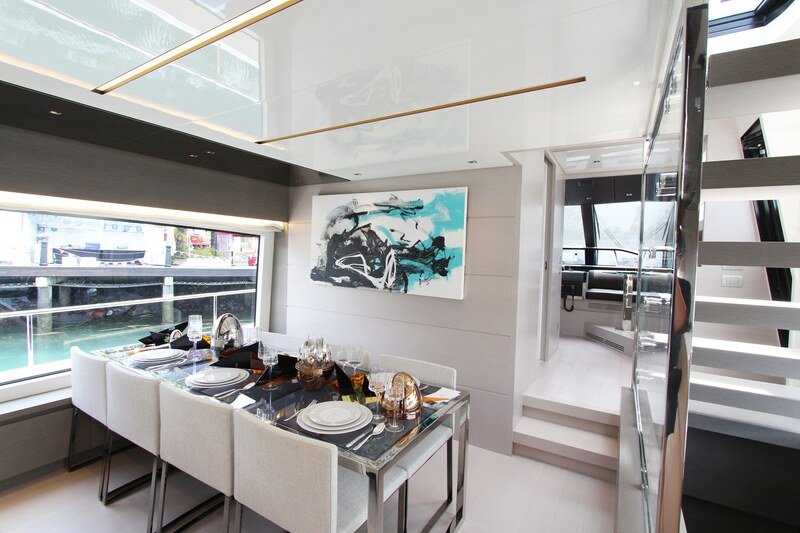 Hence, during the Show, she welcomed not only a cargo of clever design features, from a glass-walled “floating staircase” to flybridge, but also an exclusive over-water art exhibition, viewed by champagne-sodden audiences. Six works by Singapore-born abstract expressionist painter Yeo Shih Yun graced the ship’s interior walls, selected by the artist and the yacht’s representative for Asia, Simpson Marine. Yeo, director of INSTINC, an independent artist-run space, was brought in to add some Asian flavour to the open-plan salon and spacious suites, already filled with mostly Italian décor. The East-Meets-West experiment worked. It also helped that the San Francisco Art Institute-trained painter’s masterpieces on display were mainly inspired by the sea. Coral Waves is one of Yeo’s newest works, created in 2017 by combining paint and silkscreen technique. The abstract picture of blue strokes and green washes was placed next to a solid pale green-filled canvas, surely set for creating conversations, plus contrasts between the two paintings. “This is my interpretation of the beauty, movement and elegance of corals seen under the sea,” Yeo said. Her approach of fusing traditional forms with contemporary mediums has undeniably garnered much acclaim, including a commission by the Singapore Art Museum, winning the Sovereign Asian Art Prize People’s Choice Award in 2012. Here, she speaks of her latest commission, bringing her museum-worthy works to the high seas. What makes your work so quintessentially Asian? I think it’s because of my love for the Chinese ink medium and the fact the I use Chinese brushes a lot. In my works, I am aware of the significance of the negative space, just like Chinese paintings, where the white background is as important as the black ink in the foreground. You can say that my idea of aesthetics is quite grounded in Chinese ink paintings. Why release your artworks in black and white, or at most, use only three colours? Simplicity is beauty. I find that black and white are classic and timeless, just like black and white photography. I also love the contrast between black and white. I like colours that are pure and not mixed too much so that the colours used really pop. How would you link art and design? Art and design cannot be separated. They go hand in hand. Due to my background in graphics design, my paintings respect many elements of design — for instance rhythm, contrast, movement and asymmetrical balance. The location of where a painting is hung is very important. It can enhance or kill the space. The size, colours of the work and the surrounding needs to complement each other. In this case, for this yacht, I have chosen smaller works for the rooms, something calmer. For the living room piece, Besides The Sea, it is more dynamic and a great conversational piece. I have also chosen a more natural colour scheme too: Blues and greens plus black and white to create a dialogue with the natural environment of sea. Why do you think private yachts and fine art go so well together? The Sanlorenzo SL78 pays a lot of attention to design. Every detail of the yacht is designed to perfection. One of Sanlorenzo’s motto is “where art and design converges”. Therefore, it is my absolute honour to collaborate with this brand and be able to display my works in this gorgeous yacht. The yacht elevated my works and my works also gave soul to this yacht. It was a match made in heaven.